Gingerbread cookies are a tradition in my house. Every year I bake gingerbread cookies in an array of shapes from big gingerbread men with little cut-out hearts to all sizes of stars for my Gingerbread Cookie Christmas Tree. I love making all sorts of tiny shapes to use up the small bits of dough; little houses, candy canes, Christmas trees and gingerbread people. Giving away my homemade gingerbread is part of the tradition. I have lots of cellophane bags and pretty ribbon for gift giving so I can bake with abandon. Julia Child would have liked that. In the past year I’ve learned a lot about baking gluten free cookies and have shared all that in this post, Tips For Making Gluten Free Cookies. Writing my yearlong blog series on How To Use different gluten free flours inspired me to try new recipes and experiment as I learned. Cookie baking is an activity to be enjoyed, not endured. It is an afternoon or evening project in the kitchen being creative. Basking in the aroma of gingerbread with Christmas music playing in the background is a sure sign of the holiday season in my kitchen. Making rolled cookies involves counters dusted with flour (sweet rice flour or tapioca starch) a lengthy process of moving cookie dough in and out of the fridge then in and out of the oven. Rolling the dough, cutting it into shapes and cookie cutters strewn all over the counter. This is cookie baking and I love it. You can read my tips and techniques for rolling cookie dough in this post on sugar cookies. 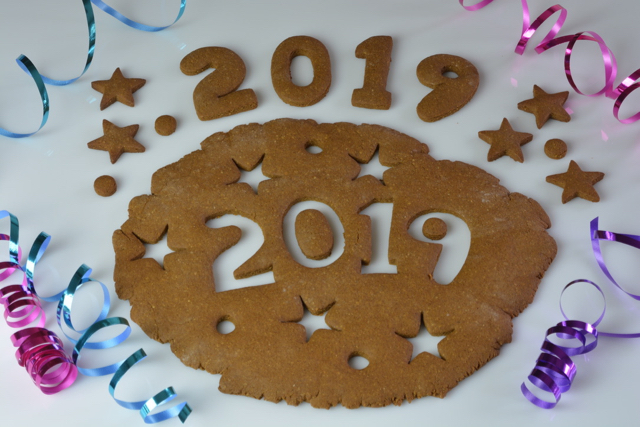 This year I set out to perfect a gluten free gingerbread cookie recipe because I wasn’t completely satisfied with the recipes I had tried in the past. So I tweaked my old favourite recipe with all the tips I have learned and this is it. A large recipe calling for a total of four cups of flour so there will be lots to eat, give away in packages and serve where ever you go. If you are adapting a different recipe, or this one, I recommend this flour combination that can be used in any cookie recipe. Do you have a file of favourite Christmas recipes? I think it’s a good idea for anyone but if you cook gluten free it can be invaluable. Create a simple system to save your personal and family favourite holiday recipes. Add the new gluten free recipes that work well for you. Then each year you just need to decide which ones you want to bake. Add new ones and replace old to continuously improve. 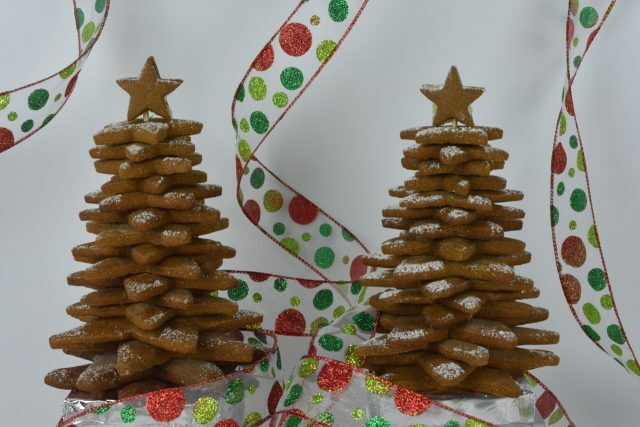 This recipe for gingerbread cookies is in my collection of holiday favourites. I made this gingerbread cookie Christmas tree with sixteen star shaped cookies a set of four star shaped cookie cutters. The cookies are stacked on some craft store dowling to create the look of a tree. I have a tiny star cookie cutter that I use for the top but if you have no cookie cutters this set of six stars would give you lots of options. Wrap your tree in clear cellophane with a festive ribbon and you will have a beautiful gift for giving. And what to do with the last of the cookie dough. I sometimes make cut outs in the last piece of dough I roll out like this. Let me know in the comments below what if you made this gingerbread or tweaked it a bit. And of course, I want to know what you thought of the taste and texture. Mix all dry ingredients together in a bowl. Set aside. In an electric stand mixer cream butter and sugar on high speed until light and fluffy. Turn down speed and add egg. Beat until mixed in. With machine running pour in molasses and cream. Reduce speed and slowly add dry ingredients beating until well combined. Divide the dough into 6 pieces. Place each piece of dough onto wax or parchment paper. Lightly dust all sides of the dough with sweet rice flour. Pat the dough into a disc and fold the paper over it. Repeat with all the cookie dough, wrap in plastic and refrigerate for 2 hours or overnight. Working with one piece at a time, lightly dusting with extra flour, roll the dough to ¼ or 3/16” thickness. Cut into shapes with cookie cutters. If the dough is too soft put it back in the fridge while working with a second piece. You should be able to cut the shape with a floured cookie cutter and transfer it to the baking sheet without changing the shape. Bake cookies on middle rack of 350°F oven for 10 minutes. Let rest on cooling rack for 2-3 minutes then transfer cookies to cooling racks and cool completely. If not eating them within 2 days store cookies in the freezer, double wrapped for maximum freshness. Using a set of star cookie cutters in 4 different sizes cut out 4 of each size. Using a small drinking straw make a hole in the center of each cookie before it is baked. Make 2 smaller star cookies for the top of the cookie Christmas tree. Bake as above. SUPPLIES: You will need a 3-4 inch square base (wood or foam) and a ⅛” piece of dowling. To assemble the tree stack al 16 stars from large to small onto the dowling. Cut the dowling just slightly above the top cookie, the top star will hide the dowling. Dab icing on both sides of two small stars and push together around the dowling. Allow the icing to harden. Rotate each star slightly until you have a Christmas tree look. Dust with icing sugar if desired. Wrap with clear cellophane and a colourful ribbon. Thank you Catherine. I’m glad you liked them as much as I did. These cookies are very good, crisp, not dry with the right amount of gingerbread flavour and sweetness.